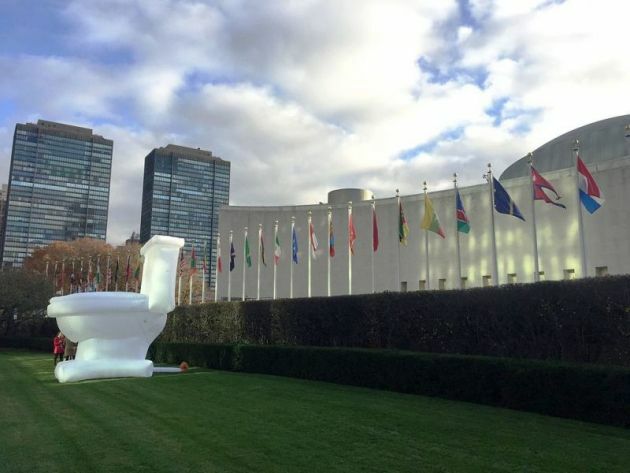 (World Toilet Organization, Singapore Creative Commons)The launch of World Toilet Day at the United Nations in New York on 18 November 2015. The World Council of Churches has noted World Toilet Day with reflections about the human right to a dignified sanitation in a world where someone tweeted that more people in the world have a phone than a toilet. In a morning prayer on Nov. 19 led by the WCC Ecumenical Water Network, those gathered drew attention to the global sanitation challenge. World Toilet Day is an official United Nations international observance day to inspire action to tackle the global sanitation crisis. Worldwide, 4.5 billion people or two-thirds of the world's population live without "safely managed sanitation" and around 892 million people practice open defecation. More people in the world have a phone than a toilet. The theme for this year's World Toilet Day is "When Nature Calls." EWN coordinator Dinesh Suna offered a reflection that touched on his home country of India, which, he said, is often called the "world's largest open-air toilet." India is investing over 20 billion dollars in trying to be an "open defecation free" country by 2019 – 11 years ahead of the deadline of the UN's 2030 Sustainable Development Goal 6 target on universal sanitation. "India has built millions of new toilets, and many of them have become dysfunctional due to lack of running water," Suna explained. "Some of them are used by the communities to store food grains and other valuables, as those toilets are the only concrete structure in the poor households and the fact that Indian culture does not promote people relieving themselves in their own houses, which are sacred." Sanitation is not only about construction of toilets but it must be looked at with a comprehensive approach, Suna noted. "When thousands of children are dying everyday due to lack of adequate sanitation facilities, we can no longer shy away from talking about toilets," he said. "When lack of sanitation robs people of their dignity, particularly women and girl children, it needs our serious attention." One possible solution may be one from Israel where HomeBiogas, a company specializing in the manufacture of small-scale biogas systems, launched its contribution to global sanitation efforts: the Bio-Toilet, The Jerusalem Post reported. Packed into one box, the compact Bio-Toilet provides a dual solution for off-grid, rural communities. The company says it is easy-to-assemble and a more dignified toilet waste solution. The toilet waste is dispatched directly to the company's HomeBiogas appliance where it is treated and turned into cooking fuel for personal use. The company based in Beit Yannai worked for two years to develop its latest waste solution, with Efrati visiting target populations in Africa and India to develop a greater understanding of the issues faced by remote communities.